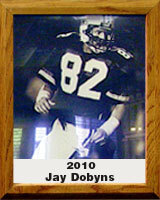 At Sahuaro High School, Jay Dobyns was an outstanding wide receiver in football. He was a two-time All-City choice and made the 1979 All-State and All-American teams. He was Sahuaro’s Most Improved Player in 1978 and Most Valuable Player in 1979. After a year at the University of Arkansas, Dobyns transferred to the University of Arizona where he was a three-year starter. He was an All-Pacific-10 Conference choice in 1983 and 1984, and was named to the Arizona Daily Star’s All-Century team for UA as wide receiver in 1999. In 1979, his spectacular touchdown catch against top-ranked UCLA proved to be the game-winning score. Upon graduation, he was the second-leading pass catcher in UA history. Dobyns went on to become a highly decorated special agent with America’s violent crime police force, the U.S. Bureau of Alcohol, Tobacco and Firearms. He was an undercover agent in more than 500 operations and won 12 ATF “Special Act” awards for investigative excellence. In 2004, the National Association of Police Officers gave Jay their “Top Cop” award after his highly acclaimed infiltration of Hell’s Angels that resulted in 43 felony arrests.